This spring inspired stuffed peppers recipe uses seasonal vegetables. Asparagus, peas, and artichokes are combined with brown rice and feta cheese to create the filling. Obviously, if you can get your hands on fresh vegetables that would be ideal but if not, I have included the option of using frozen as well. 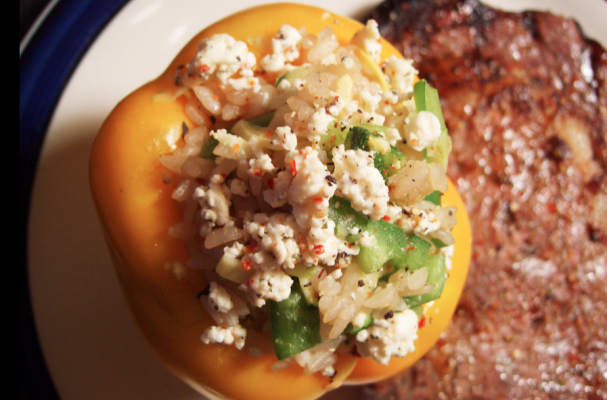 These stuffed peppers are meatless but feel free to add your favorite protein. Step 1: Cook the brown rice according to the package directions. Step 2: Preheat the oven to 375 degrees Fahrenheit. Step 3: Heat the olive oil in a saute pan over medium high heat. Add the garlic and leeks to the pan and cook until leeks have softened, about 5 to 7 minutes. Next, add the asparagus, artichoke hearts and peas. Season with red pepper flakes, salt and pepper. Continue to cook for another 5 to 7 minutes. Step 4: In a medium sized bowl, combine the cooked brown rice and sauteed vegetables. Mix with a fork until the ingredients are well combined. Add the feta cheese and fresh parsley. Taste the filling and adjust seasoning as necessary. Set aside. Step 5: Prepare the peppers by cutting them lengthwise and removing the stem, seeds, and ribs. Stuff the quinoa and veggie mixture into the peppers so it domes above the rim of the pepper. Bake them peppers for 25 to 30 minutes, then broil for 5 minutes. Remove from the oven and serve immediately.